Hillsboro’s Reese Bloomfield shoots a free throw Saturday at Hillsboro High School where the Indians battled St. Patrick (Ky.) in the Ohio Valley Hoops Classic. 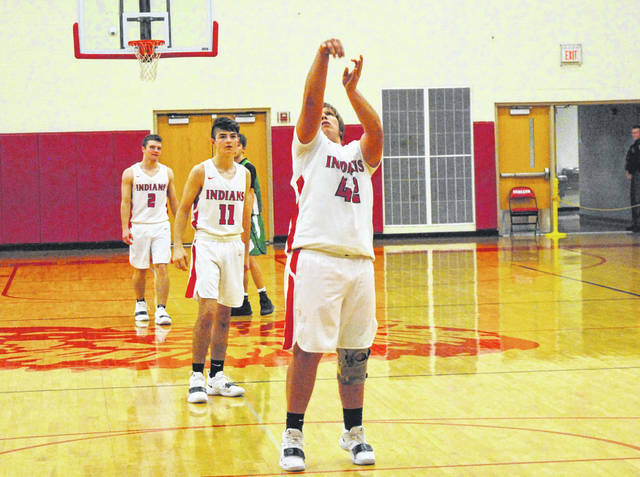 Bloomfield hit a clutch three pointer on Tuesday in the Indian’s game against Georgetown at home. The Hillsboro Indians registered a quality non-conference win on Tuesday when they beat the Georgetown G-Men 59-51 at home after trailing by as many as 12 points in the third quarter. Sophomore Gavin Temple did not record a point Tuesday but, Indians’ Head Coach Bruce Miles pointed to Temple’s defensive pressure in the third period as a major reason for the turnaround. While Temple provided the defensive spark it was seniors Ethan Watson, Mason Swayne and Josh Keets who provided the offensive spark for the Indians. Watson and Keets were the leading scorers in the game with 16 and 17 points respectively while Swayne also finished in double digits with 11 points. The Indians outscored the G-Men 37-20 in the second half of the game to secure their second win of the season. Hillsboro will open up Frontier Athletic Conference play on Friday when they host the Washington Blue Lions at home.